Thaw the turnovers at room temperature for 30 minutes or until they can be easily opened, so that each pastry lies flat without breaking the middle seam. Heat the oven to 475°F. Lightly grease or line a baking sheet with parchment paper. Stir the cinnamon and sugar in a small bowl. 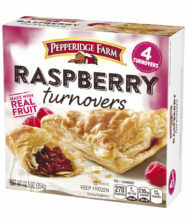 Place the opened raspberry turnovers onto the prepared baking sheet. Spread the raspberry filling to within 1/2-inch of each pastry edge. Top with an opened apple turnover, apple side up. 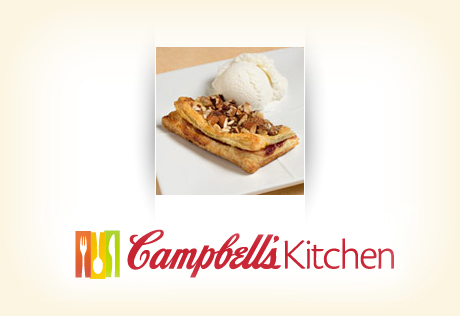 Spread the apple filling to within 1/2-inch of each pastry edge. Sprinkle evenly with the nuts and cinnamon sugar mixture. Place the baking sheet in the oven and immediately reduce the oven temperature to 400°F. Bake for 25 minutes or until the pastries are golden brown. Cut each pastry in half, making 4 pieces in all. Serve the pastries warm with the ice cream, if desired.